and Real Estate, Hong Kong Polytechnic University, Hong Kong, China. Received February 8th, 2010; revised March 10th, 2010; accepted April 17th, 2010.
an upward trend year after year. without walls”. Saying “the world flattens”, Thomas L.
services exports accounted for 10.24 billion U.S. dollars. the transformation of economic development models. the Chinese service outsourcing industry. management and to share the risks with others, etc. 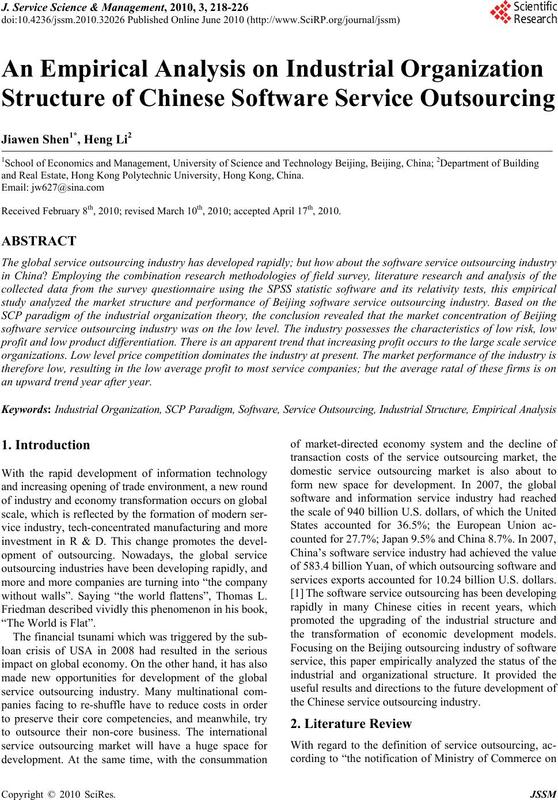 jing's service outsourcing firm in 2008.
the software service outsourcing industry at present. size, and human resource structure. by Beijing-based companies reached 459 million U.S.
upgrading of Beijing economic structure. nese-founded firms (accounting for 22%). seas firms which accounted for 43% . accounted for 53% of the total number of employees. reasons of the formation and change of industry structure. iX, a firm’s market share). companies accounted for the total output of the industry. CR4 = 27.6%, CR8 = 38.2%. technology innovation and to form the core competence. strong brands. So the industry concentration was low. easy to make up through imitating and introducing talent. trants because they do not grasp the core technology. 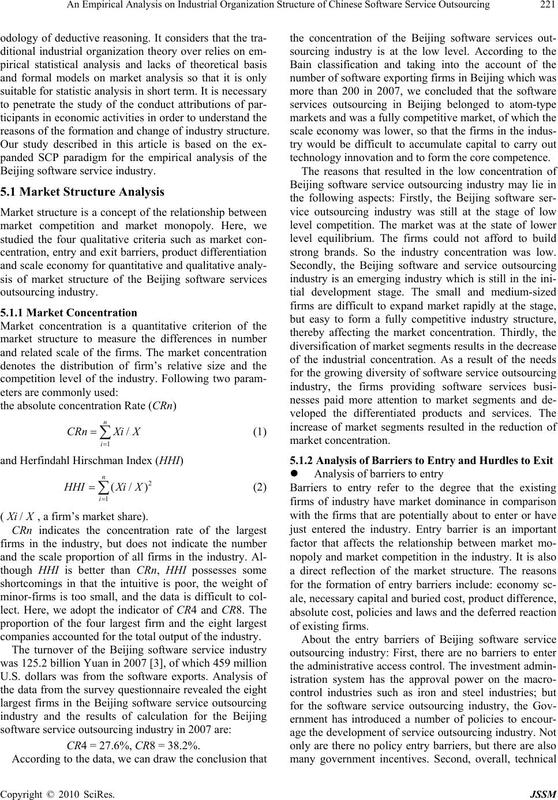 software service outsourcing industry are relatively low. concentrated in the office equipment such as computers. Therefore, the cost of unused assets is relatively low. sourcing industry are relatively low. industry in the relationship matrix is as Figure 1.
in the naissance of many sub-industries. business, customer distribution and the target market. om companies located in Hong Kong accounted for 6%. 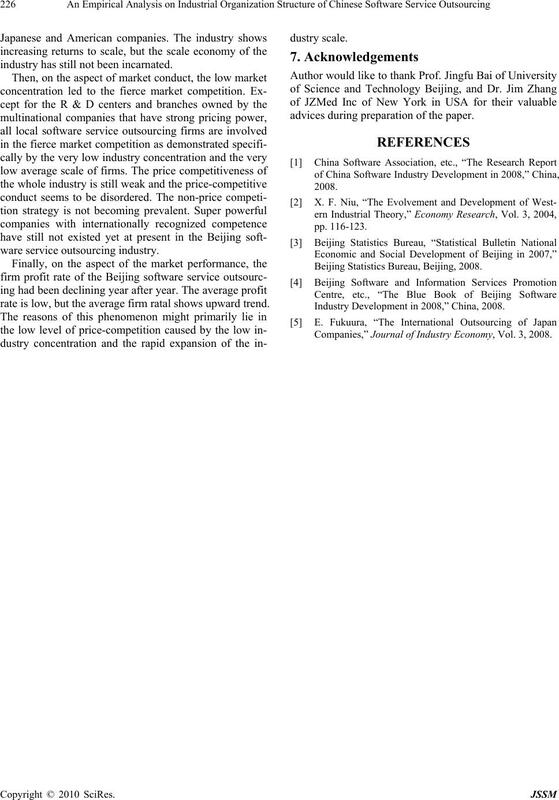 Beijing software service outsourcing industry. hypothesis false, or accept the original hypothesis. P = 0 < 0.05, so the sample is statistically significant. the Pearson correlation coefficient is 0.455 and P = 0.
employee number and the firm turnover. ing service outsourcing industry alliance. well as advertising, research and development, and so on. competitive behavior such as firms strategic alliances. much more competition advantage than domestic firms. tion, but uses few of non-price competition strategy. indicates the market efficiency on resources allocation. the industry scale was expanding rapidly. industry has still not been incarnated. rate is low, but the average firm ratal shows upward trend. advices during preparation of the paper. Beijing Statistics Bureau, Beijing, 2008. 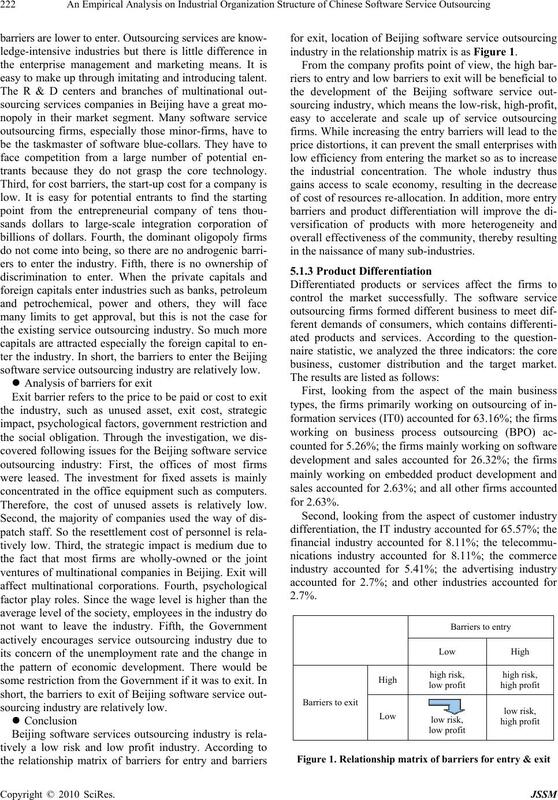 Industry Development in 2008,” China, 2008. 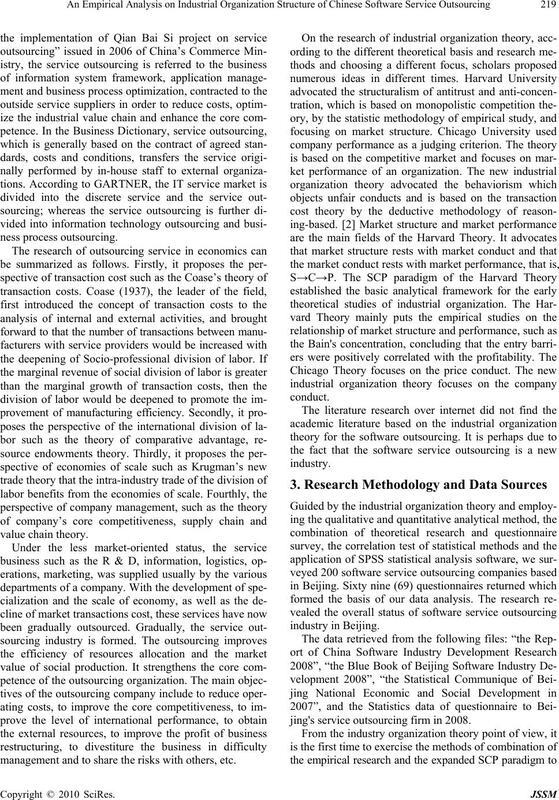 Companies,” Journal of Industry Economy, Vol. 3, 2008.